Caroline Altmann’s images beautifully capture polar qualities of natural photography in studio and outdoor settings. The outside work is riotous movement, strong colors, bent light rather than diffused. Luscious petals, dewed leaves, sky and branches are turned, whisked and blended. The studio portraits of dried flowers are opposite—quiet and detailed--metaphors of the beauty in aging. The contrasting work reflects the two pulls of Altmann’s European and Brazilian background. She was raised by German and Austrian American parents in Brazil and England, she later resided in France and Japan. Ms. Altmann is a graduate of the joint program of Tufts University and the Museum School of Fine Arts in Boston. 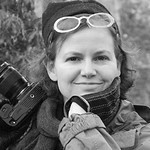 Her work has been selected into national juried shows and is in private and public collections in the U.S. and Europe.